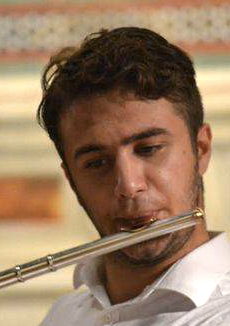 Born in San Gimignano, Lorenzo Morrocchi entered Siena’s lstituto Superiore di Studi Musicali Rinaldo Franci in 2006 and graduated at age sixteen. Winner of many competitions, he has attended master classes of renowned musicians such as James Galway in Switzerland and Milan. In 2013 and 2014 he successfully auditioned for Andrea Oliva’s advanced studies course at Accademia di Santa Cecilia in Rome. He plays a Muramatsu flute with a silver and gold J. R. Lafin headjoint, wrought by Lafin and Julie Stewart for Galway’s Switzerland master class and assigned to Mr. Morrocchi in 2012. Lorenzo began his Bachelor of Music degree at the Juilliard School under the guidance of R. Langevin.